Kyle Damron was a very attentive salesman that willingly stayed after closing time to help us out. Great experience! My family was on it's way to celebrate Easter when my car ended up suddenly with an oil leak. It was towed to San Marcos Toyota. Miles from home we were looking intiiour options of getting home, but the dealership had us back on the road just a few hours later and with the invoice far leas than expected. Bob Beaudro was on top of everything and I appreciate his excellent service. Fast service and good staff explains everything making it easy. Kyle Damron was very attentive to our needs. He was willing to work with us to stay within our budget. 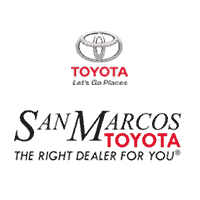 Kyle represents San Marcos Toyota with class and professionalism. My salesman at Toyota of San Marcos, Ubaldo Benavidez, was super awsome. His customer service went above and beyond expected. I would definitely recommend seeing Ubaldo if you are looking to buy a new or used car. Quick and easy!! Megan was awesome to work with. Buy a car from her! !